The Duke of York's Theatre is a West End Theatre in St Martin's Lane, in the City of Westminster. It was built for Frank Wyatt and his wife, Violet Melnotte, who retained ownership of the theatre, until her death in 1935. 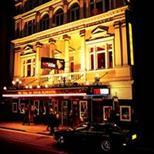 It opened on 10 September 1892 as the Trafalgar Square Theatre, with Wedding Eve. The theatre, designed by architect Walter Emden became known as the Trafalgar Theatre in 1894 and the following year became the Duke of York's to honour the future King George V. One of the earliest musical comedies, Go-Bang, was a success at the theatre in 1894. In 1900, Jerome K. Jerome's Miss Hobbs was staged as well as David Belasco's Madame Butterfly, which was seen by Puccini, who later turned it into the famous opera. This was also the theatre where J. M. Barrie's Peter Pan, or The Boy Who Wouldn't Grow Up debuted on 27 December 1904. Many famous British actors have appeared here, including Basil Rathbone, who played Alfred de Musset in Madame Sand in June 1920, returning in November 1932 as the Unknown Gentleman in Tonight or Never. The theatre was Grade II listed by English Heritage in September 1960. In the late 1970s the freehold of the theatre was purchased by Capital Radio and it closed in 1979 for refurbishment. It reopened in February 1980 and the first production under the patronage of Capital Radio was Rose, starring Glenda Jackson. The Ambassador Theatre Group bought the theatre in 1992 and this coincided with London's hottest show, The Royal Court's production of Ariel Dorfman's Death and the Maiden. A host of successes followed including Richard O'Brien's The Rocky Horror Show (celebrating its 21st Birthday) and the hugely successful Royal Court Classics Season in 1995. Comedian Pat Condell also did comedy sketches which were later released onto DVD. Today, the theatre is the London headquarters of the Ambassador Theatre Group, forming part of their portfolio of eight venues. It is also the producing offices of Sonia Friedman Productions, whose revival of In Celebration starring Hollywood leading man Orlando Bloom played until 15 September 2007. The Duke of York's Theatre is just around the corner from Leicester Square tube station, served by the Northern and Piccadilly lines. Piccadilly Circus tube station is five minute walk away through Leicester Square and is served by the Piccadilly and Bakerloo lines. The nearest national rail station is Charing Cross. From the station cross the road onto the Strand. Head west towards Trafalgar square and turn right when your reach St Martin's Place. Turn right down the path towards the London Coliseum (St Martin's Lane), The Duke of York's Theatre is just ahead on the right hand side. The Duke of York's Theatre is within the London Congestion Charge Zone which applies weekdays from 7am until 6pm and costs ú10 per day (excluding bank holidays). If you are driving to the theatre after 6pm on a weekday or on a weekend then you will not be charged. It is advised to use public transport when travelling in central London. There will be plenty of black cabs circulating the area, but the best place for a guaranteed cab is the Charing Cross taxi rank directly outside the station. There are plenty of buses operating in this area. For the Strand take buses: 6, 9, 11, 15, 23, 91 and 139. For Charing Cross take the 24, 29, 47 and 176. The Duke of York's Theatre is part of the Q-Park Scheme. The nearest participating car park is the 24hr Q Park Chinatown Car Park (20 Newport Place, WC2H 7PR). Parking costs ú18 for up to 3hrs, and ú24 for 4hrs but theatregoers can save 50% if they have their ticket validated at the theatre. 0 steps from street to Foyer, 2 steps between each row of the Royal Circle, 20 steps down to Stalls, 23 up to the Upper Circle. There are two spaces for wheelchair users in the third row of the Royal Circle at seats RC C 23 and C1. There is space for two wheelchairs and one scooter. There is a dual channel infra-red system available with two head sets. Also a Portable induction loop is fitted at the Box Office. Up to 4 Guide dogs are allowed inside the auditorium. Please contact 020 7565 6500 for disabled bookings and queries.